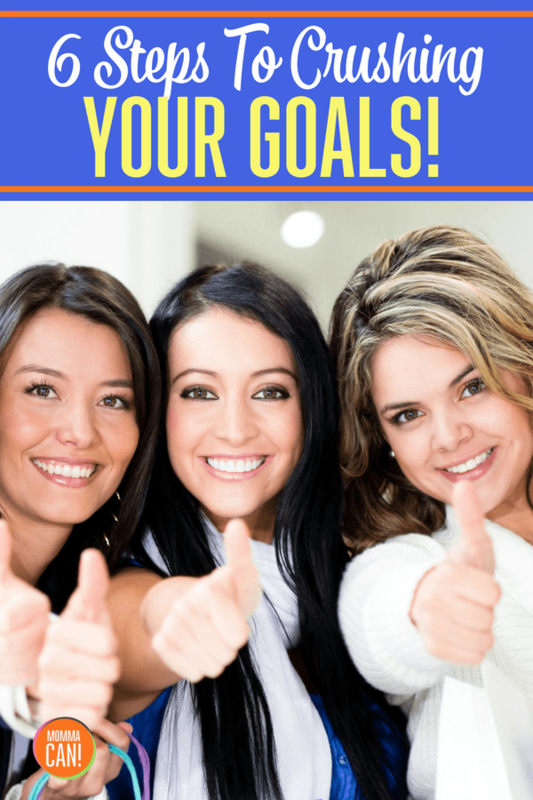 6 Steps to Crushing Your Goals! Yes, six simple steps to create life-changing steps to reach your dreams. These simple steps are our best tips for managing to reach those goals and crush them. Busy families or heck, single individuals are often exhausted after the 2-month holiday sprint, especially in December. Before you go creating resolutions that will fail, making pinky promises that you will break, or just giving a high five to your spouse that you will get your 20-year-old body back by February, TAKE A BREAK.Give your brain, body and your finances a couple of weeks to breath after the holiday rush. This radical time-out will prevent you from failing at your resolutions and gives you time to think through what you want in this new year. This break is the first step to crushing your goals. January is a great month to reflect on the good and the bad that happened throughout the year. I am not saying write an epic tale of remorse over the bad stuff and post all the goodies in a 1000 word post on Facebook but just think about it and grab a few of the happy memories and rejoice in them and take a few of the learning experiences from the tough stuff and grow from them. After your time of reflection begin planning where you would like to see yourself in the future or your vision of where you would like to be financial, physically, emotionally etc. Choose goals according to your future life plan. For example, This Week I am packing up Christmas. This Month I am creating a new habit of exercising 30 minutes per day. This year I am going to pay off credit card debt. This year I am going to kick-off a side-hustle business/job to create a nest egg for retirement. Do you get what I am saying? Your goals are not just losing 10 pounds or reading War and Peace in 1 week. Your goals are your future and a solid objective to where you see yourself and your family in the future. 4. 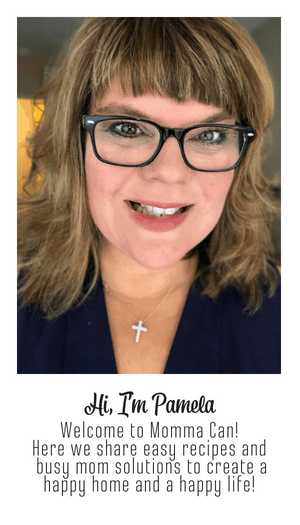 Create Steps To Achieve Those Goals – You are on your way to Crushing Your Goals! Once you have created your goals write them down and begin creating action steps to achieve your goals. For example, Write down all the actions needed to properly pack away the Christmas decorations or research and implement a strategy to get that 30 minutes of exercise in each day. Keep a notebook or electronic document filled with your goals and steps and refer daily or at the very least weekly to this valuable resource to stay motivated and to create new steps as needed for your long-term goals. 5. Choose a word or short phrase that will encourage you to achieve your goal. For example, your health and fitness goals might have been motivated by an impending anniversary trip, health issue, or just the want to feel better in your own skin. Your word or phrase could be. Vacation Bikini, Healthy Me , Goodbye Fat Pants. ( Yikes, I think my subconscious is talking) But you get what I mean right? 6. Post your word or phrase as a reminder to you each day and encourage your family to follow the first five steps to achieve their own. Last year I wrote a positive note for every mile I jogged, walked, rowed, and anything else that burned distant type calories and posted it right on the garage wall. I used different colors of post-it notes to keep motivated. I loved the experience and was miffed when I did not get to put up at least one per day. In the middle of those post-it notes was my motivational word and I looked at it every single time I walked by. 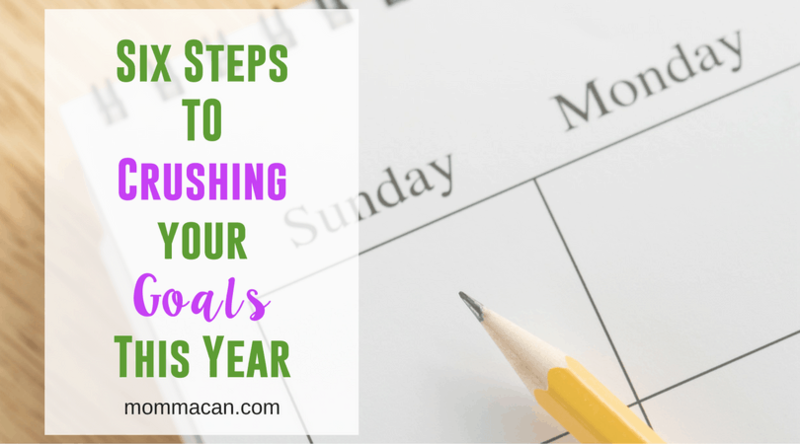 I hope you find these six steps helpful in crushing your goals! Number 1 and Number 5. YES!!!!! Take a break is so very important. I take an entire month to plan out my goals. I must have a concrete plan in place. Number 5 is a GREAT idea. My word this year is finish. GREAT ideas! Thanks!!! I love imagining what your garage wall looked like! That sounds like fun to walk past. Thanks for all your wonderful posts and just plain being awesome!! !